A close encounter with a large black bear in Seminole County, Florida caught on video recently became a teaching opportunity for Florida wildlife officials. 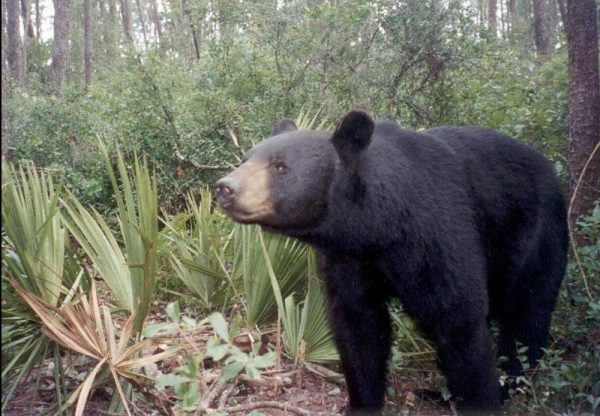 When officials with the Florida Fish and Wildlife Conservation Commission received a video of a black bear approaching a woman in the Markham Woods area where an abundant bear population exists, it was no laughing matter. The large black bear approaches the woman seated calmly on the ground at first sniffing the air likely for a whiff of something good to eat. It then sniffs the woman’s knees before waddling off. Bear spotted in Seminole County from My FWC on Vimeo. “While we are glad that no one was injured during the interaction captured on video, if this was an area where children were playing, the situation could have quickly turned tragic,” the department stated in a press release accompanying the video. Officials say that when a bear gets this close to a person, it has clearly lost its fear of humans which can potentially endanger the animal. It can either get hit by a car or find itself in a position of needing to be euthanized because it’s a danger to people in the neighborhood. State biologists were conducting a site visit to the area where the bear was spotted and was expected to conduct trapping operations nearby as well. “People should be mindful that black bears are highly unpredictable, wild animals. There have been four people seriously injured by bears in Seminole County since 2012, and we actively work to help prevent these serious conflicts,” the release stated.